The secret ingredient in these healthier truffles is chickpeas! 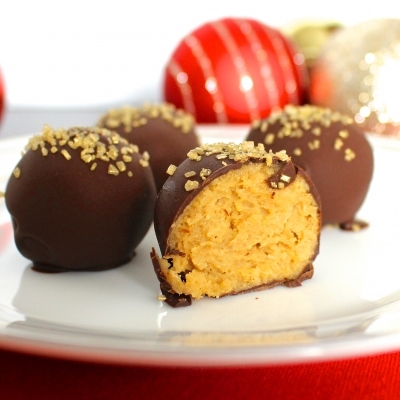 They make for a smooth and creamy truffle filling when combined with peanut butter, PB2, almond milk and protein powder. 1. Add garbanzo beans, peanut butter, Truvia and almond milk to a food process and process until smooth. 2. Combine garbanzo bean mixture, PB2 and protein powder in a large bowl. Set aside in freezer for at least 30 minutes. 3. Line a small baking pan with foil and roll mixture into small balls, less than 1" diameter. Place balls on pan and insert toothpick less than 1/4" into each ball. Place tray in freezer for at least 30 minutes. 4. Melt chocolate in a small pot over medium-low heat. Pour into a narrow glass cup suitable for dipping. 5. Remove truffle balls from the freezer one at a time and dip into the chocolate, removing excess chocolate with a spoon. Place onto a lined baking tray, twisting toothpick to remove and add sprinkles immediately. Repeat process with all truffle balls. 6. Store truffles in refrigerator until serving.